Pauline grew up in Consul which had no curling rink. 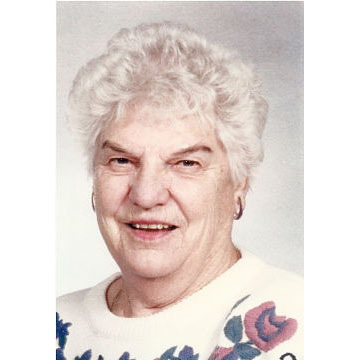 She did not take up the game until she and her husband Harold moved to Regina in 1937. She thought she needed to do something athletic, and settled on the game of curling. When she went to the rink she was taught the turns, to always keep your eye on the broom and to shoot straight at the broom. She used a “flop” delivery rather than a long slide. She tried to change, but said she could not ‘hit the broom’, so she continued to skid out on one knee and ‘let fly’ from the button. It worked just fine as she went on to skip teams to four women’s provincial finals. However, she wasn’t able to defeat the northern powerhouses of Joyce McKee, Barb MacNevin, Dorenda Shoenhals and Vera Pezer. Pauline did win two Senior Women’s Provincial titles. In 1972 as third for Adelaide Bright and in 1970 as skip. Pauline was a much feared competitor in the Regina Ladies Bonspiel for over thirty years and she enjoyed not only the keen competition, but the social aspect of the events. Pauline is a Life member of the Tartan Curling Club and the SLCA.